My dear husband, the DJ, loves him some pork chops. So do I. But I’m kind of particular about pork chops. Most boneless pork loin chops in the supermarket are so lean that you have to cook them like steak (medium), and pink pork just kinda skeeves me out. So to retain the juiciness I love about pork while still being to cook them all the way through, I always use bone-in pork chops. The bone helps the chop stay juicy and gives them an incredible meaty flavor that you just don’t get from boneless pork. 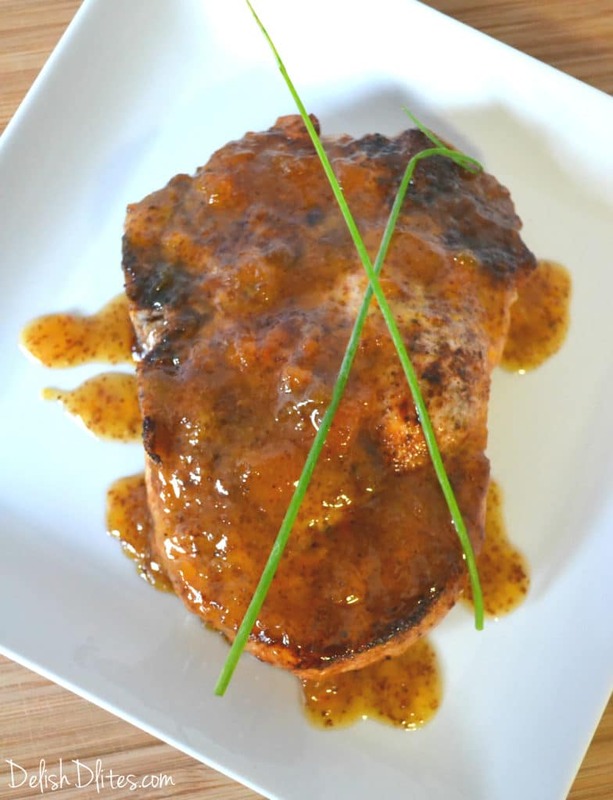 My peach and mustard glazed pork chops start off with a dry rub of salt, pepper, garlic powder and smoked paprika, then sear the seasoned pork chops, then finish them in the oven with a sweet and tangy peach preserve and country Dijon glaze. 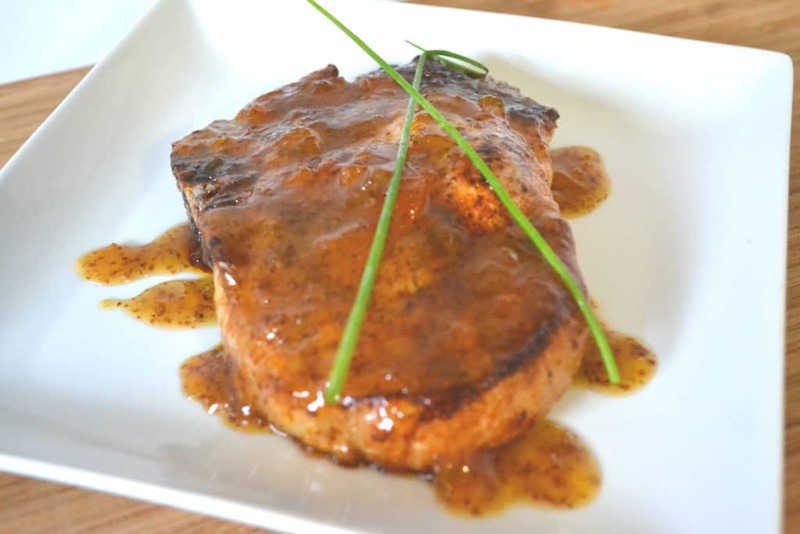 The searing/oven roasting method helps seal in the moisture for the perfect, juicy pork chops. 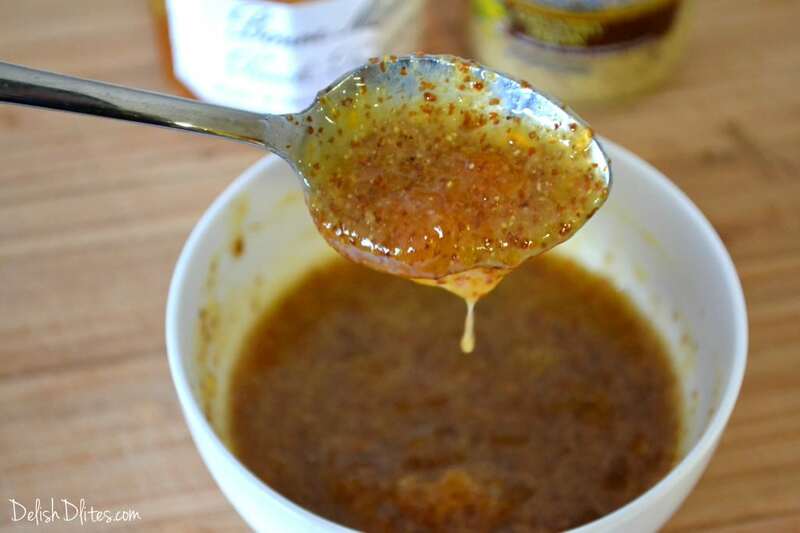 You can also substitute the peach preserves for apricot or even pineapple jam. Preheat you oven to 400 degrees F.
In a small bowl, mix the preserves, mustard, Worcestershire sauce and hot sauce. Set the glaze aside. In a separate bowl, combine the dry spice rub (salt, pepper, garlic powder and paprika). 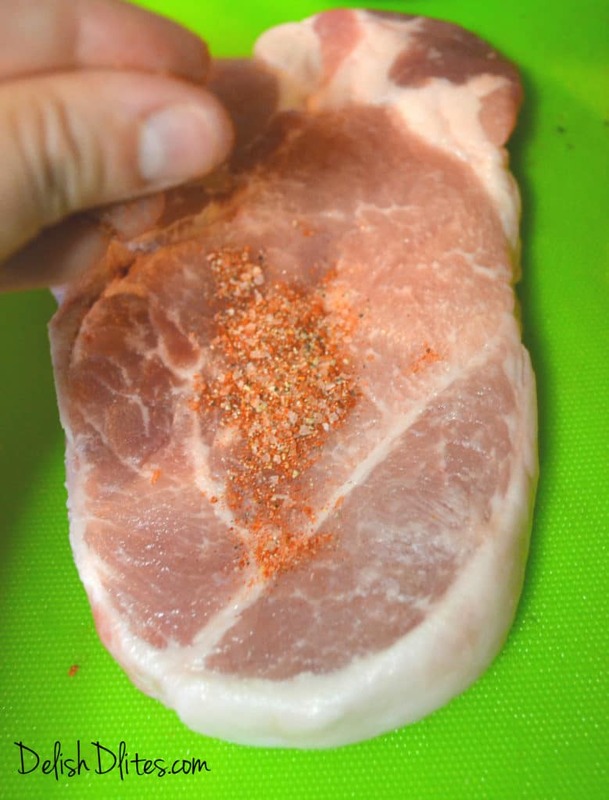 Season each pork chop generously on both sides and rub the mixture into the meat. Heat a cast iron skillet on medium high heat. Add the olive oil and the seasoned pork chops. Sear on each side for 2 minutes to get a nice crust. Once the pork chops are seared, pour the glaze over the pork chops and stick the pan into the oven. 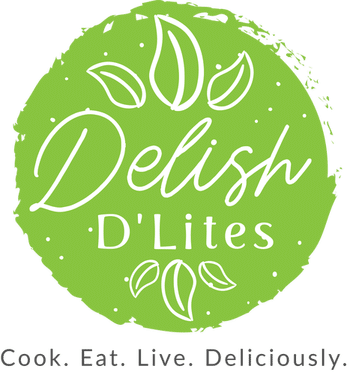 Roast until the pork chops are cooked through and register 140°F to 145°F in the thickest part of the meat with an instant-read thermometer, about 4-8 minutes. 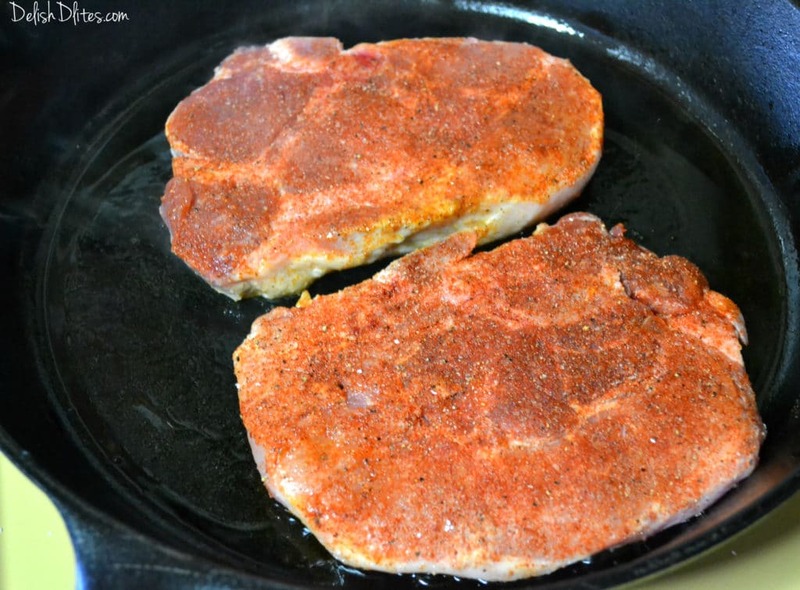 Let the pork chops rest for 5 minutes before serving, then spoon some of the glaze from the pan over the top. Heat a cast iron skillet on medium high heat. Add the olive oil and the seasoned pork chops. Sear on each side for 2 minutes to get a nice crust. 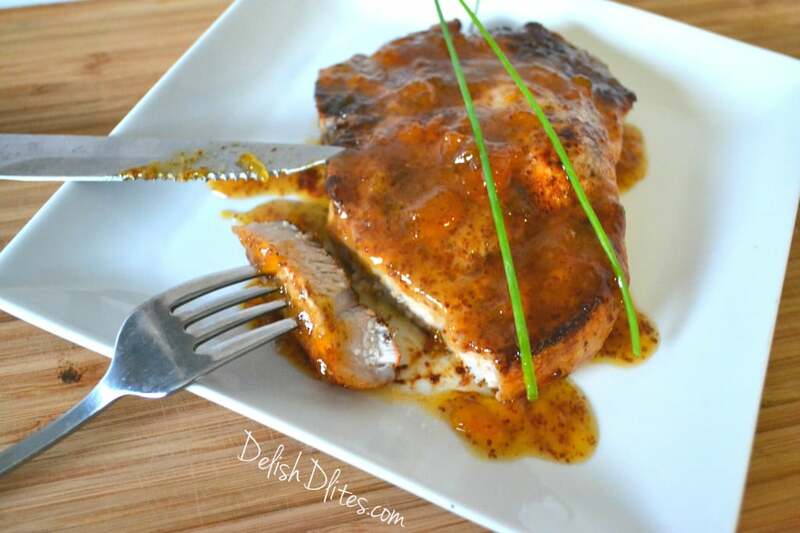 Once the pork chops are seared, pour the glaze over the pork chops and stick the pan into the oven. 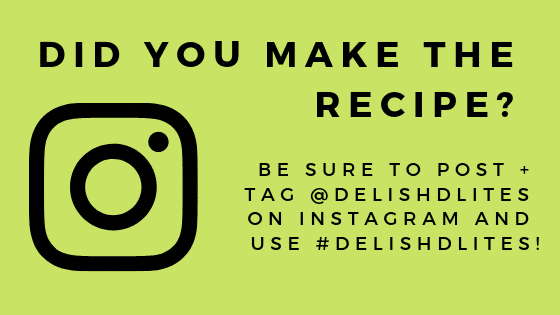 Roast until the pork chops are cooked through and register 140°F to 145°F in the thickest part of the meat with an instant-read thermometer, about 4-8 minutes. Let the pork chops rest for 5 minutes before serving, then spoon some of the glaze from the pan over the top. Making this tomorrow! I made peach preserves from scratch just for this. Made the sauce ahead and it’s delish! I added a lil whole grain mustard along with the dijon just for fun. I’m going to throw them on the grill to get some char action goin on. Thanks! Made this tonight with two 2 inch pork chops and they were fabulous. I did add some chopped onion in the oil only because I had some chopped up from last night tacos. They went will with it. Glad you enjoyed the recipe Linda! Made this tonight. Only one word to describe. AMAZING! Loved it. Great flavor, the meat was moist and such an easy recipe. A keeper for me. Great recipe! 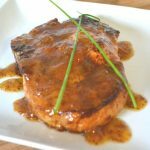 I wanted to do something a little different with our pork chops tonight and this was a wonderful recipe. Everyone enjoyed it. Thank you for sharing! I don’t have whole grain mustard, can I substitute stone ground mustard instead? Hi Karla, yes that works fine! 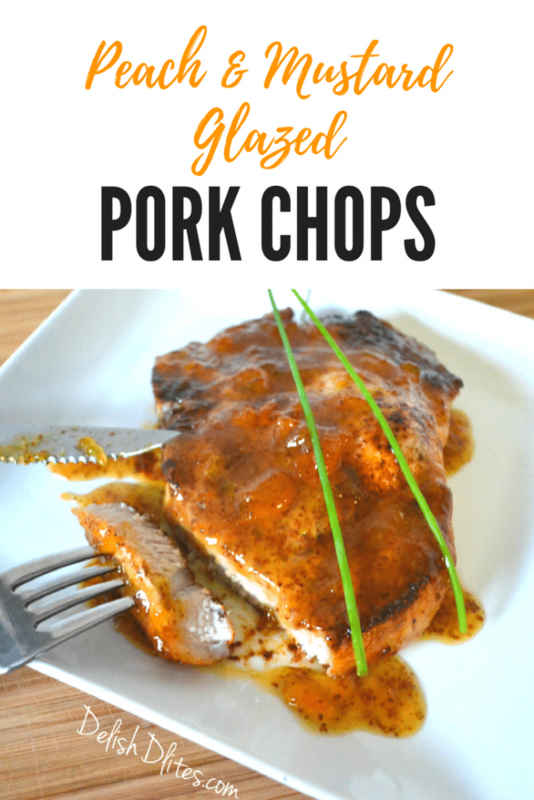 I made this for supper tonight and followed the recipe as stated, both my husband and I loved it, but Grandma scraped the sauce off the pork chop saying it was too sweet but then again Grandma hates basically everything, lol! I thought the sauce was pretty balanced, the only thing I did a bit different was after a quick browning in the frypan, I cooked the chops in a 375 degree oven instead of 400 for 20 minutes, my oven runs hotter than most. The chops were very tender and done perfectly. The recipe is a keeper and definitely worth trying, it would be great paired with sweet potato fries. So glad you enjoyed it Albianne! Made this recipe tonight for dinner and it was amazing! Thanks for sharing! Thanks so much Tina, glad you enjoyed it! This sounds wonderful but I wonder if there’s a missing ingredient..just above “2t kosher salt” the recipe calls for 4 1/2………………my question: 4 1/2 what? Mary Lou, thanks so much for catching that! 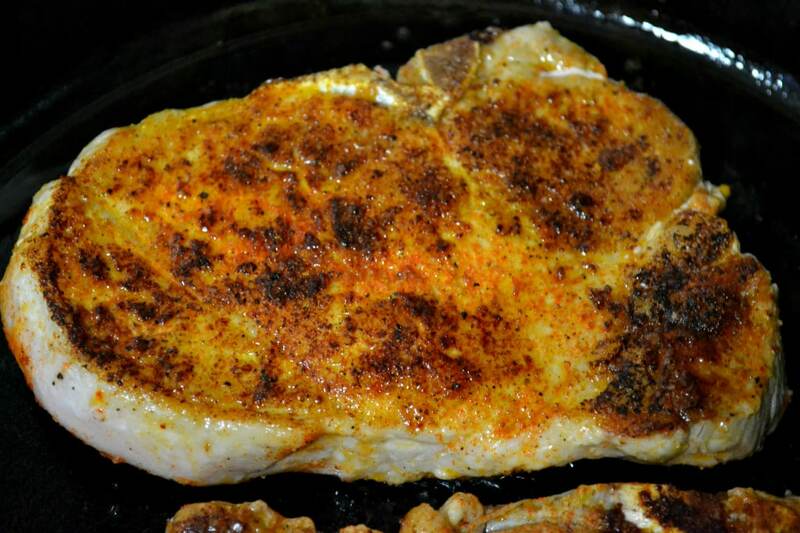 It should read 4 bone in pork chops 1/2″ thick, I updated the recipe, thanks for your help!